Hello everyone! I have a video tutorial to share today featuring a fantastic stamp set by Simon Says Stamp – Henna Patterns. 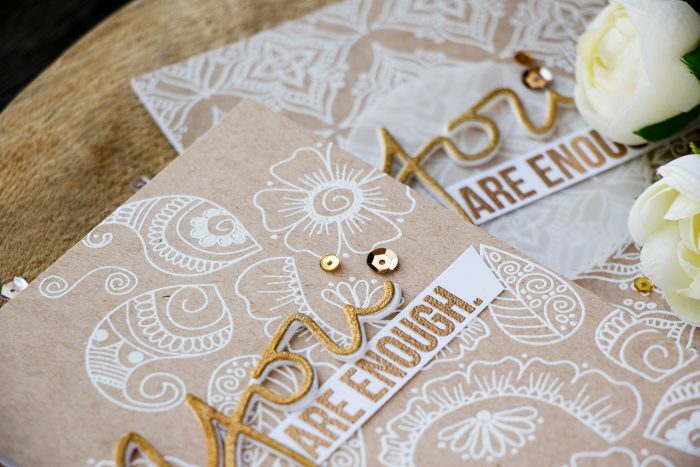 It truly is a unique set that allows us to take the art of henna tattoo and incorporate it into cardmaking. 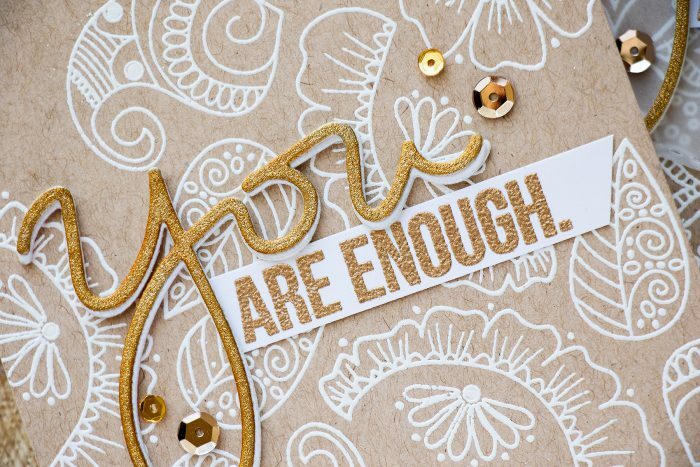 If you can’t quite picture using these designs in your cardmaking – Pinterest it! The idea is rather simple – heat emboss images in white embossing powder onto kraft cardstock to imitate the look of lace on skin. I am sharing 3 simple to create patterns in my video tutorial, be sure to watch it! I used two of the patterns to create cards I’m sharing below – I just love how clean and beautiful these backgrounds turned out. Even though I didn’t space my elements perfectly, I still was able to create lovely backgrounds. I adhered my heat embossed background onto A2 top folding card bases made out of white cardstock. 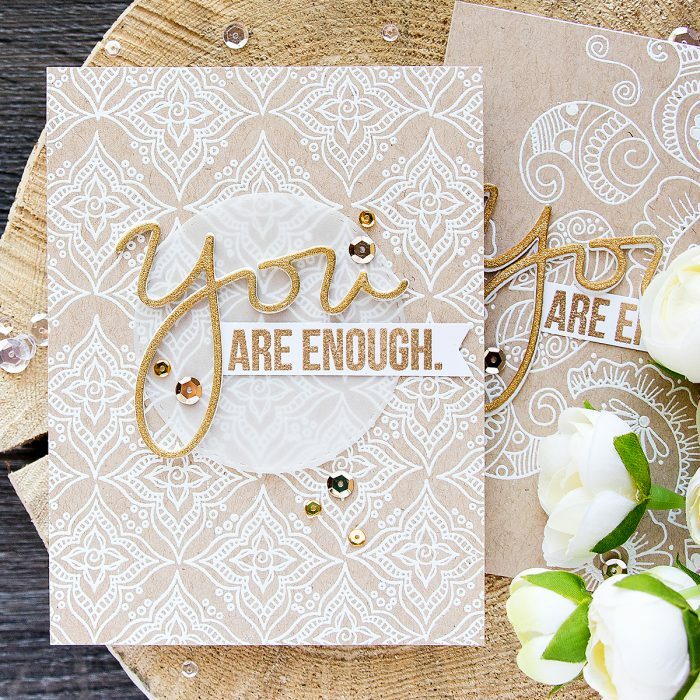 To finish my cards I used a big You from the You Matter set, it is the perfect size to work as a focal point on a card! 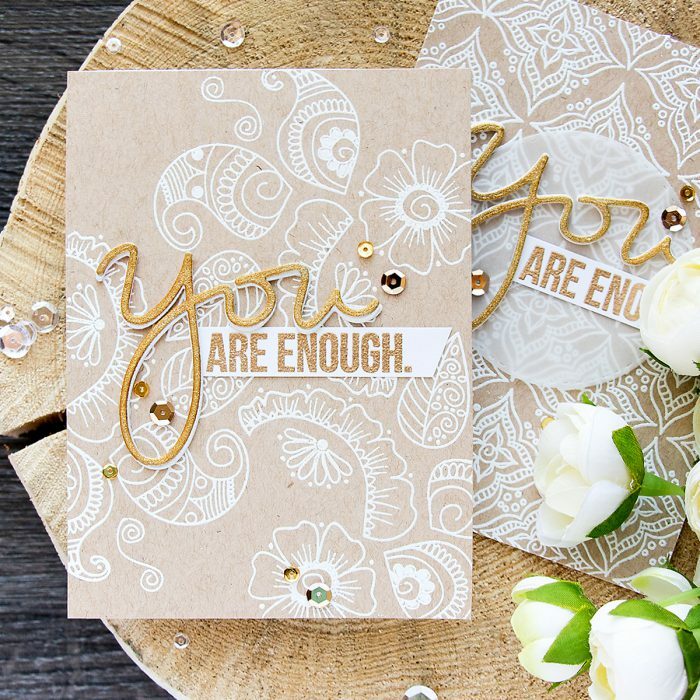 I decided to go with “You Are Enough” and heat embossed “Are Enough” in Simon’s Antique Gold embossing powder onto a strip of white cardstock. One of my “You” die cuts has a white drop shadow – I used white shimmer cardstock and also Scrapbook Adhesive’s thin foam adhesive sheets to add a pop of dimension. 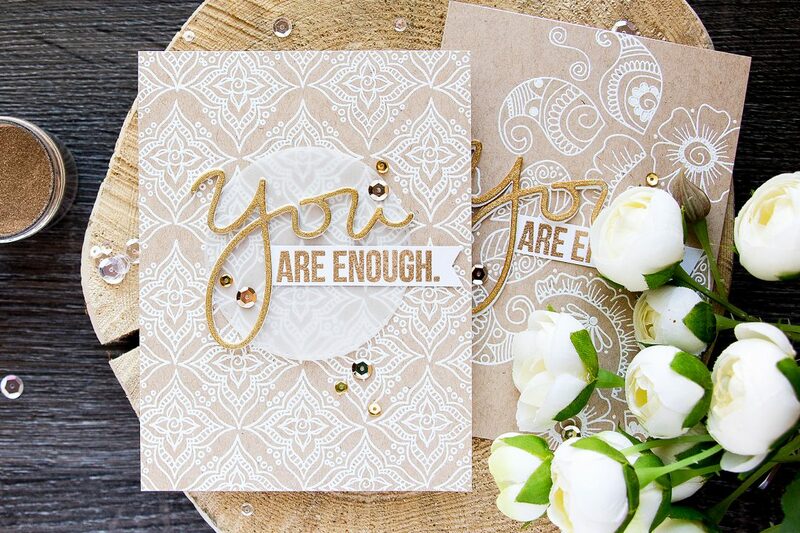 The other “You” is also dimensional, there’s no shadow but a vellum circle die cut instead. I’ll have to look at norwegian patterns on Pinterest, maybe I’ll get some additional ideas. Thank you so much, Izzy! Looks like homemade lace! Very pretty. Fantastic cards, reminds me of indian weddings I had the pleasure of attending.. brings a smile to my face. What amazing cards. First time seeing henna designs/stamp set and you did not disappoint! Love your cards! glad to hear! thank you, Suzanne! Very beautiful cards! Love the lacy look and intricate design on these stamps. Gorgeous! These are really nice cards! Again, I love everything you make! These are just lovely! !